Yesterday was one of those days where you put the phone down and then question your sanity. I had just agreed to a BBC Breakfast film crew coming to our home only a couple of hours later to talk about - well it has to be Crufts doesn't it - it's the season. I had put a few obstacles in the way - my obligations to do the school run - for example, but no - they still wanted to come and could do it after I had my darling seven year old with me - no probs. Kids and dogs, always a recipe for success when filming. I was not dressed for TV, it wasn't a rare good-hair day, the house and dogs were certainly not broadcast-standard either and of course my in-tray was overflowing as usual. Still - needs must. The Crufts media issues this year seemed to have turned into a strange attack on heelwork to music - I wanted the spotlight moved back to something more sensible, ie health and the importance of testing. I certainly have no problem watching dogs running about doing clever stuff. It is certainly much more demanding of their brains and anatomy than the normal dog show competition! Anyway the crew were nice - although 'crew' these days is just two people, in the past we've had just the one person in a crew for ITV - he did the sound, lights, camera and did the interview, too! Very eco-friendly! Dawn, the reporter, was a bit nervy around dogs so her stint at Crufts on Thursday was going to be testing. Although I have to say being greeted by Oscar putting both his paws on her shoulders was a baptism of fire. I'm sure Jeremy Paxman doesn't have the same distractions as Dawn had when he's formulating his questions - Oscar and Tess stuck to her like a magnet every time she opened her mouth! The item is due to go out on Thursday's BBC1 Breakfast show and I cringe when I think what garbled footage they managed to get! Oscar and Tess were meant to be just in the background - but for some reason they were each very keen to find their five minutes of fame. We shot the piece in the garden sitting around a big table - so my rapid spring clean was in vain and, sadly, I hadn't had the time or the skills to catch up on several years neglected weeding! Eventually they settled down a bit and Tess decided to sit next to me and look into the camera - Oscar got a bit bored and we had to stop filming as the sound man could hear a strange noise. It turned out to be Oscar chewing the table! Oh dear. They were intent on showing me up. And those interested in continuity should keep a close eye-out to see if my answers are edited out of sequence. At the beginning of the piece I was wearing a black cardigan. By the end it appeared to be cream mohair! Oh well, did I make the point that it's okay to put on a flash show that's entertaining - so long as the fundamentals are right but sadly they're not. The Swedish "Crufts" has green carpet and Andrew Lloyd Webber-style theatrics, too - but they also have mandatory health testing for all dogs before they are bred from - and clear rules to follow for improvement of those results. Plus they have a temperament test before a dog can become a Champion. How incredibly sensible! Did I let the KC off lightly this year due to my own dogs conspiring against me and putting me off my game? We'll have to wait and see... but at least we now know which one of the dogs is eating the garden furniture! I'm sure with the magic of editing they'll get a great piece out of it. Or do you think you'll add to your reknown in the next It'll Be Alright On The Night? What don't they like about heelwork to music? Is it that some dogs with no sense of rhythm are embarrassed about dancing in public? I shall have BBC breakfast TV on tomorrow! 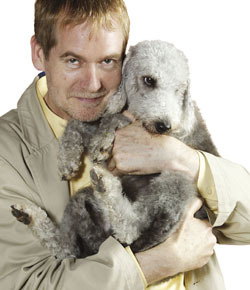 I don't know if you have been following the press coverage, but it all kicked off with lovely Paul Keevil - the famous lookalike of his Dandie Dinmonts - trying to whip up publicity for the Vulnerable breeds. He did a sterling job of getting the plight of the declining Glen of the Imaal etc talked about - but then went on to say Crufts had become a bit too "all teeth and hair" and American. And that has spun into an attack on dancing for some reason! Poor Paul has been drummed out of the brownies for daring to speak out against the mighty KC even in this quite gentle and oblique way. So far as I know he doesn't have an allergy to line dancing or sequins. I was disappointed not to see and flying dogs and down stays. The magic of TV. For those that didn't see it they used the answer to one question and I bet no one can actually remember what I said! Our Chief Sub Claire Horton-Bussey knew it was coming on and saw the earliest version of the oft repeated piece. First time it came on she thought, "Doesn't Tess look pretty - what did Beverley say?" Next time same thing happened. Tess eye-balling the camera meant that no one actually heard what I said at all! Being such a brief comment in a string of negative comments about Heelwork to music meant that people then just imagined what I was likely to have said. I got a very angry lady on the phone saying she'd seen me on TV that morning and how dare I pick on people showing dogs at Crufts. I had to explain to her that if she had listened to what I had said I had been hoping to complain about health testing not being a requirement of registration - but due to editing, I had actually probably said some of the most supportive things I'd ever uttered about Crufts! I think I say it was more like a festival of dogs these days and that the new elements were more entertaining and that the old 'Miss World" formula was quite distasteful to some people. After 15 minutes of lively debate my "Mrs Angry" on the phone started complaining about the KC as much as me and we parted friends! I really do think that all these dog show people who perceive me a "that bloody woman" could possibly be converted to being on the same side if I talked to them individually for 15 minutes. I think for the weekly dog papers I have become their pantomime baddy and it would probably take Max Clifford to clean up my image and get them to see my motives should be in tune with theres as both love dogs, it's just I'm looking to the uncomfortable future and trying to change things before we end up so deep in a hole that we can't get out.